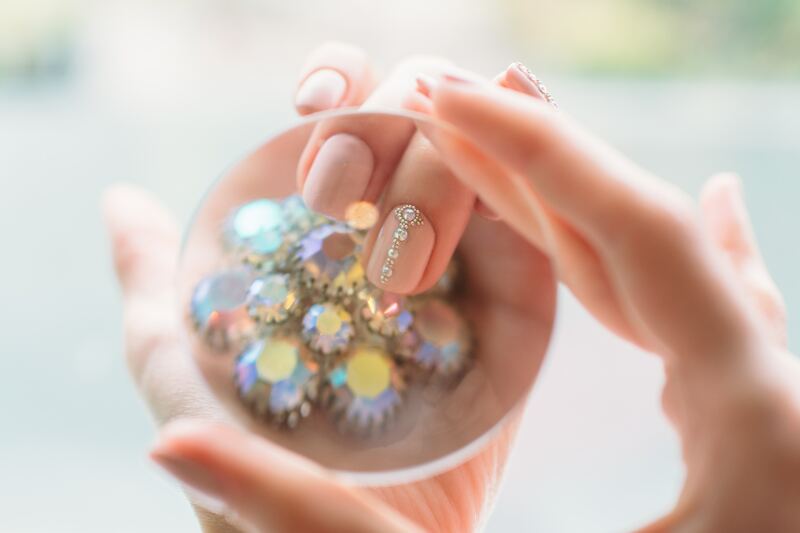 Whether you want your nails to look beautiful because your class reunion is coming up, your best friend is getting married or you are heading out of town to meet a long-lost relative, professional nail technicians have the tools, experience and skills necessary to give you the gorgeous, natural-looking nails you desire. For the most part, nail technicians use acrylic, gel and silk to create artificial nails. The material that is best for you depends on a number of factors. For example, if you want to commit to wearing your artificial nails for an extended period, you should consider acrylic or gel nails. However, if you are not necessarily interested in lengthening your nails, but you want to repair your nail(s) or strengthen your nail tips, you should choose silk. First, your nail technician will ‘rough up’ your natural nail: This helps ensure that the acrylic adheres closely to your nail. As your technician creates your artificial nails, he or she will mix together a powder and a liquid. This mixture is then brushed onto your fingernails. Generally, your entire nail will be covered; however, there are times when a flexible form is used to assist with sculpting your nail extensions. Furthermore, your technician may decide to extend your nails by applying nail tips. As the acrylic mixture is exposed to the air, it hardens. Your technician can now shape your nail to your desired length and style. As your nails grow, a small gap forms between your nail beds and the acrylic nails. Every two or three weeks you will visit your nail technician so he or she can fill in these gaps for you. If you decide that you would like to have your acrylics removed, this can be accomplished quite easily. Your technician can remove your acrylic nails without prying or forcing them – both of which can cause damage to your natural nail. The gel used to create artificial nails is nothing like the thick gel products of years gone by. Today, the consistency of these gels resembles that of nail polish. Thus, allowing for a natural-looking result. If you want to extend the length of your nails, your nail technician will apply nail tips before he or she applies the gel. Just like their acrylic counterpart, gels will grow out and filling in is required every few weeks. For the most part, gel nails can be removed by immersing them in nail polish remover. However, not all gel nails can be removed in the manner; therefore, you must speak with your nail technician before attempting to remove your gel nails at home. These wraps are designed to strengthen weak nails or assist a cracked nail as it grows out. Wraps may also be used to strengthen nail tips. Your technician fits the material to match the shape of your nail. The material is held in place while he or she brushes on the glue. The adhesives used to apply wraps lasts from two to three weeks. If your hands frequently come into contact with water, the glue may loosen sooner. After your silk wraps are applied, you should wear gloves when you wash dishes or perform any other task that requires you to submerge your hands for any length of time. If your wraps do come off, your technician can reapply or remove them at your next visit. Now that you know the difference between acrylic, gel and silk artificial nails, take the time to find an experienced nail technician in your area.